Right then, so Crusaders miss the chance to go level on points with Ballymena United, although in fairness that would probably have been a brief snapshot anyway as Ballymena have three games in hand. If their push to retain the Gibson Cup wasn't over before tonight, it probably is now unless the two sides above them have a late-season meltdown. As for Glenavon, it's a hard fought point that keeps them within touching distance of the Crues. Join us again tomorrow for the HUGE game at Windsor Park between Linfield and Ballymena, and of course all the other action from the league. We'll be here from two and hope to see you then! Derry City's Jamie McDonagh gets sent off for a reckless tackle near the touchline on sub Trevor Clarke. Former Derry player Aaron McEneff scores with a lovely little chipped penalty past Peter Cherrie. He enjoyed it, too, and didn't mind celebrating the goal that looks like sealing all three points for the home side. 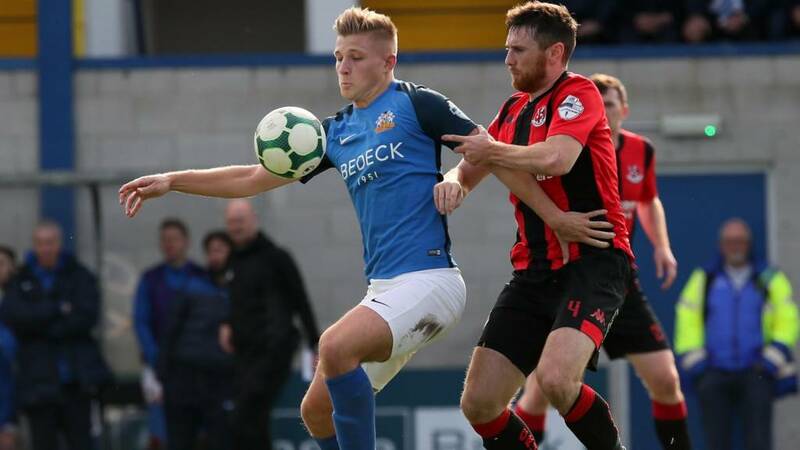 Glenavon earn a point after a much-improved second half display. Strange second 45 from the Crues but credit must be given to the visitors. Josh Daniels' strike was good enough to take something from the game, cancelling out David Cushley's first half opener. Cheeky Gary Hamilton, he's a wiley old fox. In front of the TV cameras he's bringing himself on for a three minute cameo. He deserves his moment though, after 350 games in charge of the Lurgan Blues and all that. We're into three minutes of added time and it's Glenavon who continue to look the likelier side to find a winner. Andrew Mithcell miscontrols a pass which momentarily lets the Crues off the hook. It took a while to get his transfer sorted out, but Michael McCrudden is now on the pitch as a Derry City player after coming off the bench for Junior Ogadi-Uzokwe. Before Daniel's equaliser Andrew Mitchell twice went close to equalising for Glenavon. You'll not hit a ball cleaner than that! Josh Daniels makes it 1-1 and you can't say they don't deserve it. Eoin Wearon fizzes the ball in from the right and Daniels, running in from his wing catches is on the volley and it screams in to the roof of the net before Sean O'Neill has time to raise his arms. Jonny Tuffey's palms are finally warmed when David Cushley absolutely leathers a ball towards the roof of the net. The keeper pushes it over the bar. Cameron Stewart is on for Aaron Harmon, which probably means Conor McCloskey goes wide while Stewart operates down the middle. Andrew Mitchell slams an effort off the upright and Crusaders survive! A ball in the box causes havoc and Sean O'Neill saves from Rhys Marshall but the rebound falls to Andrew Mitchell whose right footed half-volley smacks the middle of the post. They are getting closer though as Crusaders continue to invite the pressure. Stephen Baxter turns to the bench as he seeks to re-invigorate his side. Gary Thompson comes on for Reece McGinley which signals a change in shape for the hosts, one would imagine. Maybe a diamond in midfield with Cushley and Ronan Hale up top? Crusaders haven't created anything in the 15 minutes of the second half. David Cushley tries to change that with a not-so-subtle push in Caolan Marron's back which allows him through on goal. He applies the finishing touch but the referee rightly brings play back for the push. "Away! Get it out!" come the cries from the home crowd as Glenavon continue to pile on the pressure. Aaron Harmon opts to shoot from distance when he should play it out wide. The effort goes left but it's a much livelier Glenavon side that have re-emerged from the dressing rooms. Kyle Owens is in the book after taking down Conor McCloskey. A Dylan Watts goal in the 29th minute separates the sides at the break. Derry are working hard and have limited Rovers to few chances, but will need to create more openings in the second half if they are to get anything out of the game. Robert Garrett and Ronan Hale exchange a few polite words. The Glenavon man is on a booking so would be wise to walk away. He does and from the resulting free-kick Andrew Mitchell prods towards goal at the back post but it's straight at Sean O'Neill. Lively start to the half from Glenavon with Aaron Harmon whipping a ball to the back post that just evades Eoin Wearen. Hamilton's words still presumably ringing in the visitors' ears. The teams are back out with no half-time changes from either side. David Cushley's eighth goal in his last 10 appearances in the league has Crusaders in front.